Well i am not the biggest fan of sugar cookies . I ofently find them to be un-interessting and fade even though they can be flavored with vanilla or lemon zest. So i tried a new flavor , rose water (or rose extract) . It gives it a deep flowery flavor without beeing so strong and overwhelming , it is subtle and yet it magically compells your palate and takes you on a trip to a magical summery garden . plus those roses petals looks gorgeous adding an effortless pictursque look to it as a finishing touch . Whip the butter and sugar until it becomes white-ich and fluffy , add in the egg and keep the mixer on medium speed utill you get a homogenous texture . Sift in the flour baking pouder and a pinch of salt and don't forget to add the rose water . Gently form a dough with a spatula or with your hands and place it on a parchment paper . Roll out the dough and cut it into any desired shape using a cookie cutter . Bake the cookies in a 180 degree preheated oven for 15 min , they should stay white and they will harden when cold so don't worry about them beeing undercooked . Now let's move to the icing , actually this is easy place all of the ingredients and mix them until you get a silky shiny icing . 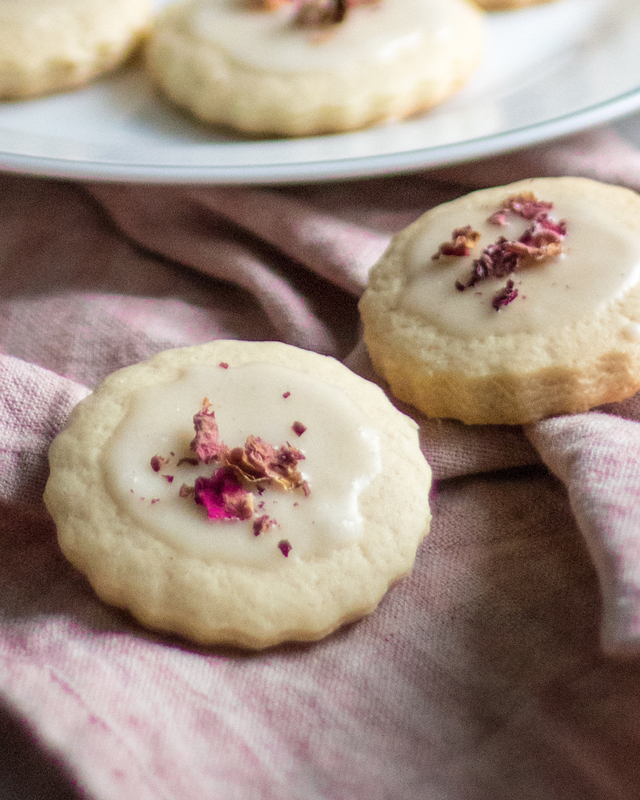 Wait until your cookies are fully cold and decorate them with the icing and sprinkle some rose petals on top for decoration .